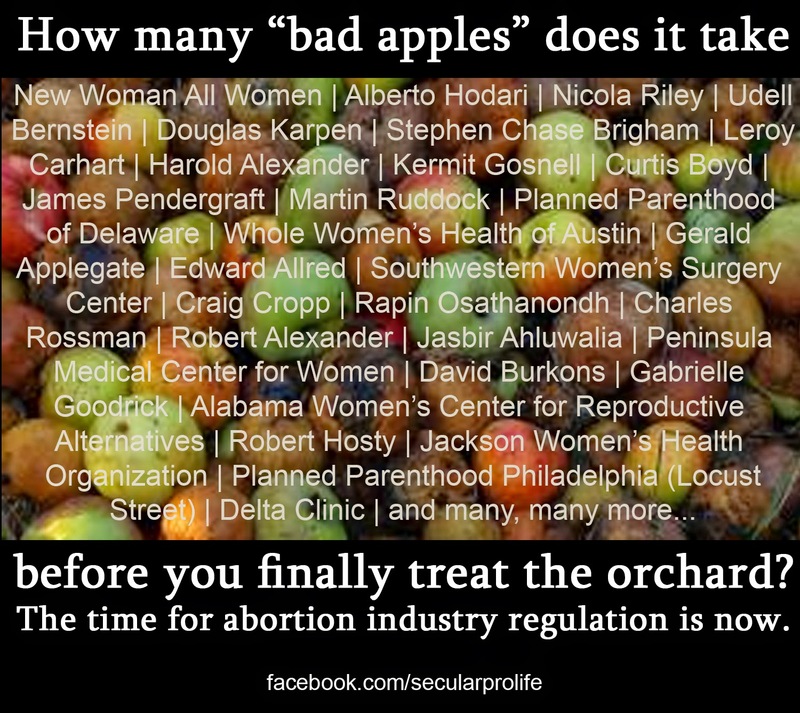 Secular Pro-Life Perspectives: How many "bad apples" does it take before you finally treat the orchard? How many "bad apples" does it take before you finally treat the orchard? Just a few notes about the above graphic (which I encourage you to share on facebook). This is just a sampling of the abortionists and abortion facilities that are known to have endangered women, as evidenced by health code violations, repeated ambulance calls, and medical malpractice lawsuits. The key word is "known," because in the absence of effective abortion regulation, abortionists can hide their malfeasance for years. Such was the case with Kermit Gosnell. He operated in Pennsylvania, where a pro-choice gubernatorial administration refused to enforce abortion laws. He was finally caught by accident, when the feds took an interest in his shady prescription painkiller side business. If only he'd quit while he was ahead and not expanded into drugs, he would have gotten away with murder. Every time, inevitably, each and every one of these abortionists is dismissed as an "aberration." But those aberrations add up quickly. There are fewer than 1,000 active abortionists in the United States. Think of it as a large group of bad apples in a relatively small barrel. Fifty or a hundred substandard abortionists is much more significant than, say, fifty or a hundred substandard dentists. More information on the listed names and others can be found at abortionsafety.com (an SPL project) and abortiondocs.org (an Operation Rescue project), both of which link to primary sources. For more on abortion regulations, visit Americans United for Life.